Savannah Marshall will this evening face potentially her toughest test as a professional when he takes on Alejandra Ayala at the York Hall. 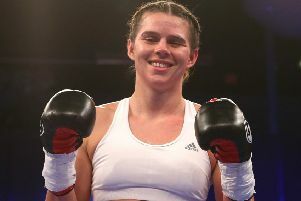 The Hartlepool middleweight’s third pro outing against her Mexican foe tonight comes after a two-round demolition of Ester Konecna last month in Bolton. And the fight will again be shown live on TV, with Dave covering the Hayemaker Ringstar promotion which sees heavyweight prospect Joe Joyce headlining. Experienced Ayala is a 10-fight pro, with eight wins on her record, five inside the distance. And Marshall knows she will have to be on her A game if she’s to continue her rise in the sport. “I enjoyed my last win, but this is a step up in class and one I’m really looking forward to,” Marshall said.